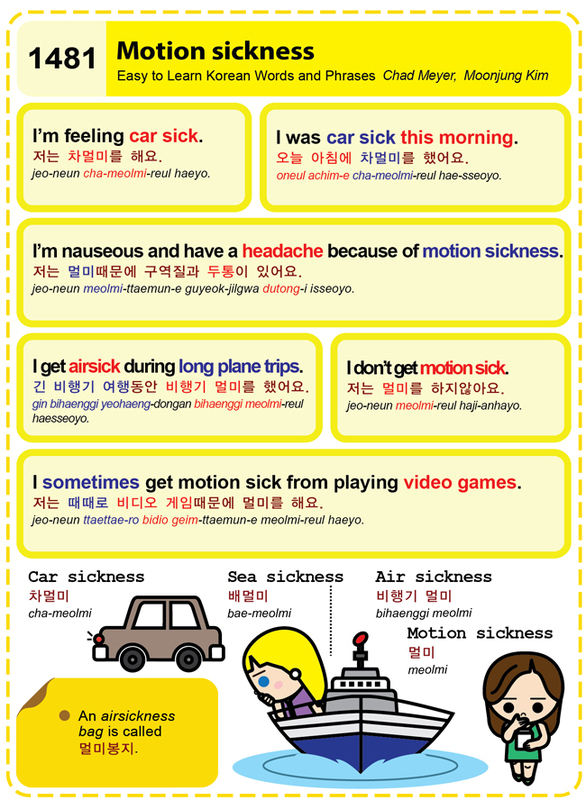 Easy to Learn Korean 1481 – Motion sickness. This entry was posted in Series and tagged air sickness, air sickness bag, car sickness, I don’t get motion sick., I get airsick during long plane trips., I sometimes get motion sick from playing videogames., I was car sick this morning., I’m feeling car sick., I’m nauseous and have a headache because of motion sickness., motion sickness, sea sickness, 긴 비행기 여행동안 비행기 멀미를 했어요., 멀미, 멀미봉지, 배멀미, 비행기 멀미, 오늘 아침에 차멀미를 했어요., 저는 때때로 비디오 게임때문에 멀미를 해요., 저는 멀미때문에 구역질과 두통이 있어요., 저는 멀미를 하지않아요., 저는 차멀미를 해요., 차멀미 by easykorean. Bookmark the permalink.